At the Montelucia Resort & Spa, classic, historic architecture meets the most modern amenities creating a luxurious atmosphere for all guests of the Montelucia Resort & Spa. Whether traveling for adventure, romance or relaxation, Montelucia Resort & Spa can accommodate for all. The Poolside Room - These wonderful rooms are located near the resort pools. They are available with one king-size bed or two queen-size beds. The Poolside Rooms are all around 500sf. These rooms also include a private balcony or patio. 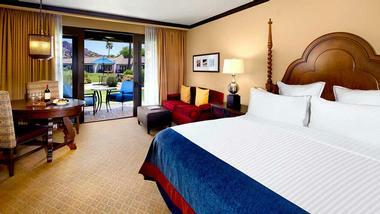 The Camelback Mountain View Rooms - These rooms are available with one king-size bed or two queen-size beds. They are also 500sf and include a 100sf balcony or patio. Guests who choose to stay in the Camelback Mountain View Rooms may always enjoy a view of the iconic Camelback Mountains. The Grand Mountain View Rooms - These are available with one king-size bed or two queen-size beds. The view from its spacious balcony includes the majestic Scottsdale Mountains as well as the Oasis or Kasbah Pool. The rooms are about 500sf. The Resort Suites - These suites have one-bedroom with a roomy living area, sofa bed, and private patio overlooking a panoramic view of the desert. These suites are about 640sf. The Poolside Suites - These suites are an upgrade from the Poolside Rooms. These suites are around 640sf and include a living area with a sofa bed and private patio. The Grand Mountain View Suite - This suite provides guests with a view of the Kasbah Pool or Oasis Pool, along with the Camelback Mountain in the background. This suite is 674sf and includes a private balcony. The Camelback Mountain Suite - This suite is an open, one-bedroom suite with a king-size bed. The full master bath includes a separate soaking tub and enclosed shower, living area with vaulted ceilings, dining room table, extra half bath and private patio. This suite is approximately 1,200sf and accommodates for guests in need of a more spacious lodging experience. The Two Bed-Two Bath Suites - These larger rooms are around 1,100sf and perfect for families traveling with friends or children. The master bedroom includes a king-size bed, bathroom with a separate soaking tub and walk-in shower. The second bedroom has the option of either two queen-size beds or a king-size bed, as well as a private patio or balcony. The two bedrooms are connected by a parlor with ample seating available, as well as a 150sf patio. Guests can choose between a desert view or Kasbah pool-side view. For guests with disabilities, there are also ADA accessible rooms available at the Montelucia Resort. Prado - This restaurant is available to guests and locals alike. It is open daily for breakfast, lunch, and dinner. Prado is known for its communal, festive atmosphere. Dishes and entrees have a Spanish Andalusian flare while also accommodating for the American palate. Guests can view the magnificent Camelback Mountain while they dine. Both outdoor and indoor seating are available. Mbar - Guests can indulge in all their favorite tapas, cocktails, and sangrias. Like the Prado, the beverages and tapas have a Spanish Andalusian twist. Mbar is open every day for happy hour. Guests can also enjoy the outdoor communal seating at the social fire pits. Live music is provided by local artists, including eclectic jazz and contemporary, upbeat genres. The Taqueria Centro - This restaurant brings the tastes of Central Mexico to the Montelucia Resort & Spa. Open daily for lunch and dinner, guests can enjoy the laid-back atmosphere while enjoying the gorgeous views of the Camelback Mountains. Many of the dishes are prepared using the ingredients supplied by farms all throughout Arizona. Along with their unique variety of authentic Mexican entrees, the Taqueria Centro also serves specialty cocktails, margaritas, and Arizona micro-brews. The Crave Café - This unique café and eatery is a gourmet food market that provides quick, on-the-go options for guests. The Crave Café also features Peet’s Coffee & Tea, while also selling bottles of wine, fruit smoothies, frozen custard and any number of traveler’s necessities and gifts to take home. In the winter months an outdoor fire pit is lit to keep customers warm. An outdoor patio with seating offers guests a comfortable place to come by, relax and take in the nature all around them. 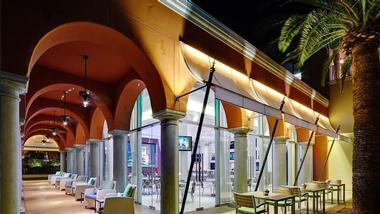 The Joya Terrace - This eatery is exclusive to spa guests at the Montelucia Resort & Spa. In a tranquil, relaxing environment, guests enjoy healthy menu items as well as specialty cocktails and champagnes. The spa-inspired, pool setting has received national recognition for its luxury and views. The Joya Spa - Guests can experience a full-service spa treatment. Inspired by Andalusia of Southern Spain and Moroccan deserts, guests can indulge themselves in facials, massages and hair and nail services. The Resort’s 31,000sf Joya Spa is the gem of the Montelucia Resort. The Joya Spa offers a wide variety of naturopath well services. Trained, board certified professionals at the Joya Spa focus on stress rehabilitation, health, and well-being of all guests. The Joya Terrace Pool - Guests will find this enormous pool at the very top of The Joya Spa. It is reserved specifically for spa guests. 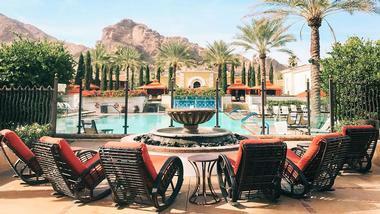 The pool offers one of the best views of the Camelback Mountain and is the perfect compliment to a day at the spa. Guests can relax by sipping a cocktails poolside, taking a dip on a sweltering summer day, or enjoying the pool heated to a comfortable 85 degrees in the winter. There are world-class golf courses all located within a short distance of the Montelucia Resort & Spa. Each golf course is complete with its own unique characteristics. The Montelucia Resort is at the center of all the premier golf courses. The Scottsdale area has almost 200 golf courses, all of which incorporate the natural beauty in its design. The golf courses featured by the Montelucia Resort include Eagle Mountain, Longbow Golf Club, Camelback Golf Club, Grayhawk Golf Club, We-ko-pa Desert Golf Experience, and the Sunridge Canyon Golf Club. 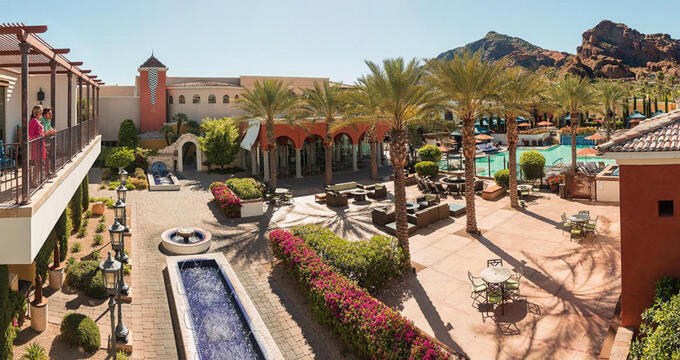 Popular summer activities around the Montelucia Resort & Spa include the AZ on the Rocks (a local rock and fitness gym), Butterfly Wonderland, Diamondback baseball games, iFLY indoor skydiving, Museum of the West, Odysea Aquarium, Musical Instrument Museum and Topgolf. The Montelucia Resort & Spa is known for being “The West’s Most Western Town”, due to its extensive number of activities available to vacationers. The Resort offers a two-day Romance Retreat to couples looking for a romantic getaway. Activities on the first day of the retreat include breakfast at Prado. The retreat then continues to Downtown Scottsdale. Couples can spend some time shopping in boutiques, walking through the park or experiencing The Scottsdale Museum of Contemporary Art. Couples will then head to the Scottsdale Wine Trail, which consists of five different Arizona wineries. Couples will then make their way to Prado for some traditional, Andalusian tapas and live, eclectic music. Couples can complete the night strolling leisurely throughout the carefully landscaped grounds of Legends of the Destination. Through its artifacts, the Legends of the Destination inform the guests about the history of the Omni Scottsdale Resort & Spa of Montelucia. There are also opportunities for guests to explore Paradise Valley by hiking and/or biking the trails. There are also many bike routes available. The hotel concierge assists guests in locating these trails and routes. There are also guided hiking adventures available for guests who wish to visit the sights of the Sonoran Desert. This desert consists of sandstone rock formations and some of the best views of Paradise Valley. People who wish to hike to the summit can choose between the Echo Canyon Trail or the Cholla Trail. Both trails have steep grades and require a higher level of fitness. Echo Canyon Trail takes approximately 90 minutes to 3 hours to reach the summit and back. The distance to the summit is 1.14 miles. Cholla Trail is 4 miles east of the Montelucia Resort and is 1.4 miles to the summit. Hiking time on Cholla Trail is 45 minutes to an hour each way. At the Joya Spa Boutique, guests can shop amongst skin care products, jewelry, fitness and workout clothes, swim wear and formal evening wear for all their fashion needs. Similarly, at the Dulcinea Boutique, shoppers can shop all the latest fashion apparel from top, well-known designers. The Boutique also sells fashion accessories. Both boutiques are open daily.